The Saudi government has just made a major military move away from the United States and toward Russia, reports Geostrategy-Direct, a private intelligence service offered by the somewhat clandestine East West Services, Inc. In a report titled "Fears of U.S. ‘grand bargain' with Iran sends Saudis to Moscow" (available only via paid subscription), it details the recent visit to Moscow by Crown Prince Sultan bin Abdul Aziz of Saudi Arabia, where he reportedly began a strategic dialogue with President Vladimir Putin and spent (according to the Gulf Research Center) $2.2 billion on scores of main battle tanks and up to 150 Mi-17 and Mi-35 helicopters. 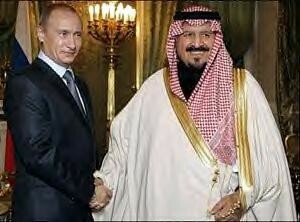 Russia's President Vladimir Putin (left) greets Saudi Arabia's Crown Prince Sultan bin Abdul Aziz at the Kremlin. Why the shift in policy in Riyadh? Geostrategy-Direct emphasizes its fears of a U.S.-Iranian deal, with lesser attention to access to military technology without all the strings attached by Washington, particularly in the areas of spy satellites and nuclear infrastructure. Surely other factors also have a role here, including a Saudi sense of the growing animosity to the kingdom in the United States. Russian Orthodox Churches in Saudi Arabia? Turkey, Still a Western Ally?